We get a lot of questions about our milking process. 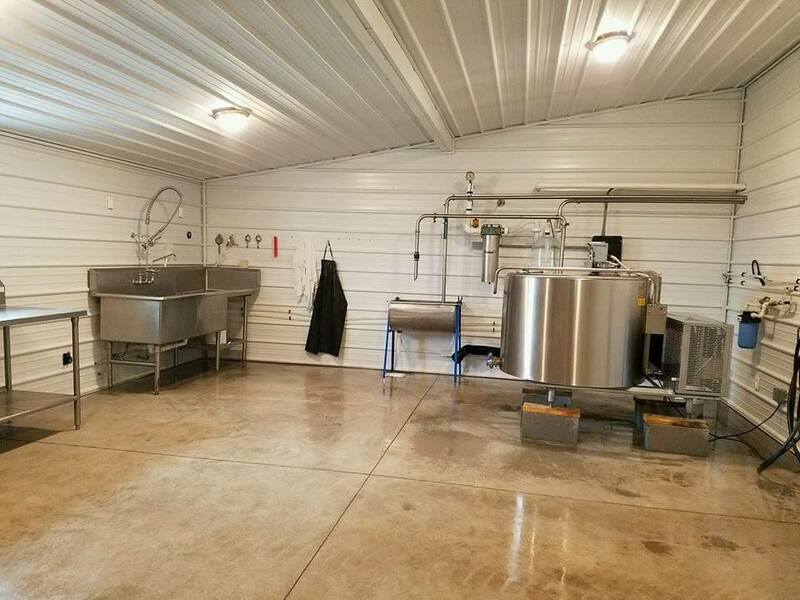 We don't allow visitors in our milking parlor during milking hours for sanitary reasons and to keep our dairy animals from getting stressed so this page is to provide a virtual tour of our milking parlor. We milk in a flat barn and we milk every 12 hours. We are set up to milk three cows and two goats at a time. 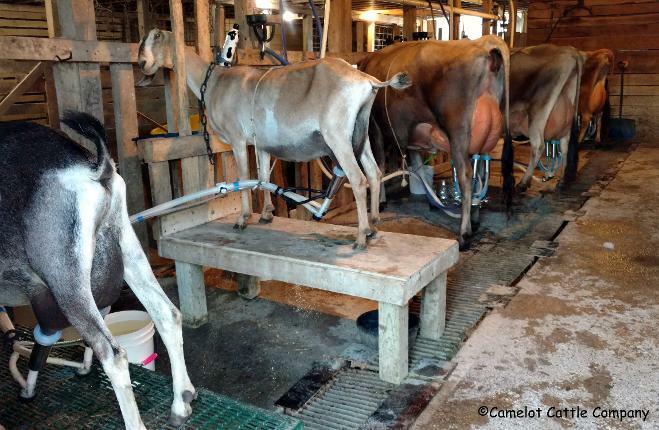 Everything is done as sanitary as possible and the cows and the goats are all milked by machine. The milkers are sanitized before and after each milking. The goats have milk stands they hop up on for easy access while the cows just walk straight into their stanchion. The girls all know the routine well and come in the barn in the same order every milking. They go to their stanchion and stand eating during the milking process. Their udders and teats are carefully washed with warm soapy water and then dried. 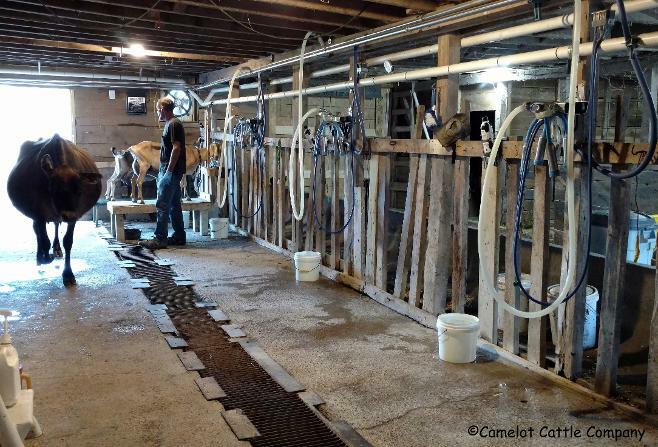 We strip a few squirts of milk out of each teat and then the freshly sanitized milkers are put on the cow/goat. The machine milks the girls out while they get a good grooming and then the milker is removed and each teat is sprayed with Fight Bac, a disinfectant teat spray that helps close the orifice and prevent mastitis. Then any special attention she needs is administered such as lotion for dry skin, manuka honey salve to prevent chapped teats, soothing peppermint oil massage for any edema, etc, and then she is released from the stanchion to go back outside. As each cow is milked out the milk is transferred by stainless steel pipeline into a stainless steel milk tank that filters and immediately chills the milk. The Jersey milk is then bottled directly from that tank and put into the cooler ready for customer pick up. The goats are milked into a separate bucket and the milk is then immediately filtered, bottled, and chilled. Here we have washed all the equipment and are bringing in the first group of milkers, Puff and Flirty on the goat stands, and QT heading to her spot. You can see the stainless steel pipeline where the milk goes directly from the cows into the tank and bottling room. Here is the first group of milkers hooked up and milking, Flirty and Puff on the stands, then Hadara, Quickie, and QT. Here is the tank and bottling room. You can see the stainless steel pipeline where the milk comes in the room and into the tank during milking. 1 Peter 4:10 (NIV): Each of you should use whatever gift you have received to serve others, as faithful stewards of God's grace in its various forms.